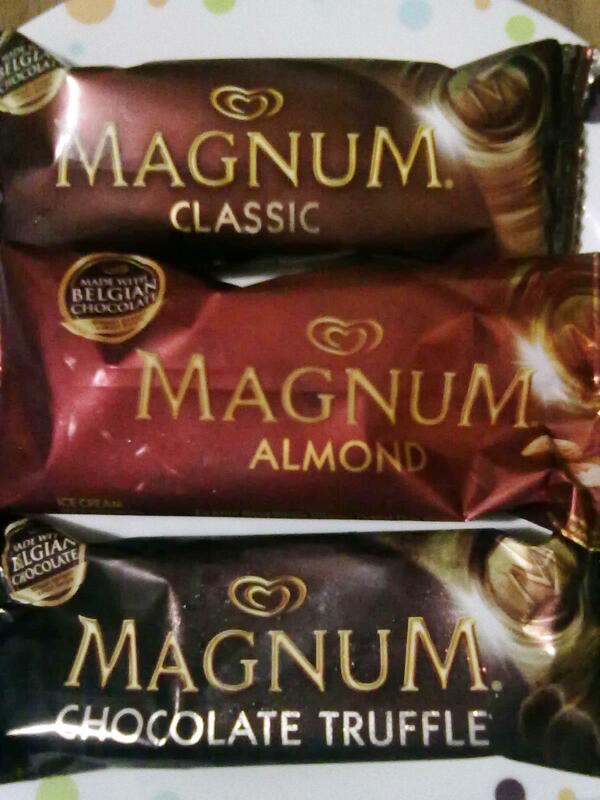 Finally, I had my first ever taste of that famous Magnum ice cream everyone has been clamoring about lately. I got all three flavors just to try them. It was indeed a magnificent Magnum moment! It’s true to what the theme of TV advertisement say about it. You’ll surely feel like royalty! It was almost midnight on a drizzling cold night when the need to have a bite or lick of the most talked about Magnum ice cream prompted me to hurry over to a nearby 7 Eleven shop. Thanks to a special person. He got me all three Magnum ice cream flavors which include the Magnum Classic, Magnum Almond, and Magnum Chocolate Truffle. I started to bite into the flavors of the classic Magnum first. It was the very first flavor released for this brand. Although the Philippines (courteousy of Unilever Philippines) only got to experience the sumptuous ice cream recently, the Classic flavor has actually been offered since 1989 in Denmark, where Magnum originated. The Classic variety isn’t anything new although it would appear that it could be the very first vanilla ice cream coated with chocolate drop considering the fact that it was made public as early as 1989. I’ve seen ice cream flavors offering a similar combination in the local market before. The only difference, which is what makes it clearly stand out, is the fact that the chocolate coating is made from Belgian chocolate, the finest blend the world has ever known. I never got to eat the whole ice drop. The size isn’t like an ordinary ice cream we see everyday. It’s enough to fill a meal although it’s supposed to be a dessert. I made him finish off the remaining half for me. As for the price, it costs Php 60 for a piece, the same applies to the other flavors. Next, I worked my way into finishing the Magnum Almond bar. Like the first, I wasn’t able to eat all of it and shared half again. The Almond variety is similar with the Classic except for the coating. You still get Belgian chocolate but with crushed almond nuts spread all over it. I was too full to eat the last bar. I thought of eating it the morning after but gave it to my older sister instead. I don’t know how it tastes like personally but based from what I’ve heard, Magnum Chocolate Truffles is not like the other two. The crust is made of truffle syrup mixed with chocolate. It’s also coated with chocolate filling. Again, it’s Belgian chocolate, mind you! There are only three flavors currently available in the Philippines right now. But elsewhere around the world, there are 25 flavors offered. These are listed below as seen on the Magnum Wikipedia page. 1989: original Magnum, later became more popularly called "Magnum Classic"
As for me, a few moments of all three Magnum flavors will be more than enough for me to say that it is indeed a magnificent and royalty-like experience to have a bite of the famous Magnum ice cream everyone seems to love.